Promotional merchandise is the perfect advertisement today. It’s long lasting and if you have chosen the corporate gift properly according to your audience, you will have a very high success rate and increase in business. Business gifts are a wonderful way to get attention to your company as you can personalise each gift according to your company, occasion, as well as audience. One such great business gift is the promotional mug. There are so many great types of promotional coffee mugs that you can offer it to just about any kind of audience. There are a great many types of corporate gifts you can choose from but none as versatile. The promotional mug can be completely personalised and if you get really creative the actual gifting of such gift can be not only memorable but fun for both parties. Promotional Coffee Mugs come in many shapes and sizes and are offered in many wonderful materials. You can find great classic promotional mugs that you see everyday, as well as the more modern fun and creative new ones. 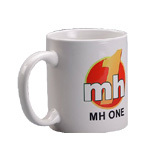 There are the ceramic mugs, the plastic mugs, as well as the modern metal and stainless steel promotional mugs. Since corporate gifts can be completely personalised you can get them in the color scheme of your company, so it matches your look and style. If you are gifting a corporate gift to a specific client and want to make it personal, do a little research on the client and have a personal message imprinted on the mug, or even a picture; with of course, your company name and logo on it somewhere. The customer will surely appreciate the extra thought and will keep it in mind the next time they are given a choice between you and another company. The mugs are either used as their primary use to put their favourite drink in, but are also great for decorating the table. Promotional mugs are a fun and straightforward gift which will certainly impress and be used well in to the future. It doesn’t matter how they select to make use of the mug, as long as they and everybody round them is in plain view of the mug and are continuously reminded of your company. If the customer isn’t a coffee or tea drinker, or already have their favourite coffee mug, they can put it on their table and use it to put their pens and pencils in it.